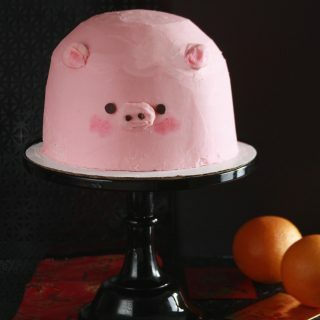 Strawberry Sundae Cake? Yes I know it’s January but hear me out! The weather does not deter North Eastern residents’ desires for ice cream. Those first few frigid weeks of January did nothing to stop its consumption. Driving down the salt encrusted roads, you see people coming off of work and school going to a local Stewarts and buying half gallon bricks of ice cream. My visits to Boston confirmed my assumption—New Englanders were equally unperturbed by the temperature. Wandering around Cambridge after my brother’s workday—with doubled layers of gloves and bandannas covering our faces against the Charles River’s wind—we saw the ice cream shops solidly packed with customers. So the internet may not like my ice cream-in-winter logic, but I find it culturally critical for the North East. 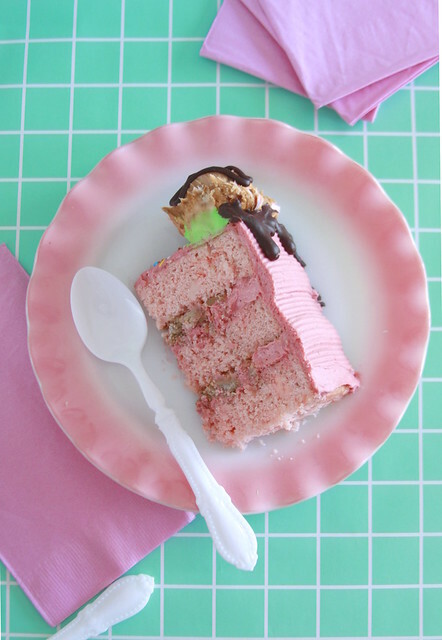 Ice cream is needed in winter, so why not pay homage with an ice cream inspired cake? I went for the flavors of a banana split—strawberry, chocolate, and banana. I’m not one for popularized mixes that add flavor to any of these “most pinned strawberry recipes.” A reduction of strawberry puree concentrated that fresh fruity strawberry flavor without watering down the batter. The Strawberry Sundae’s strawberry frosting gets flavor—not from extracts—but from freeze dried strawberries. It may seem odd to add pureed banana to a crumble, but you get the same crumb-cake-like crumbles, only with a wonderful natural banana flavor! Neither the strawberry nor the banana compete on the palate. These two fruits compliment each other, and create the sensation of an ice cream sundae. 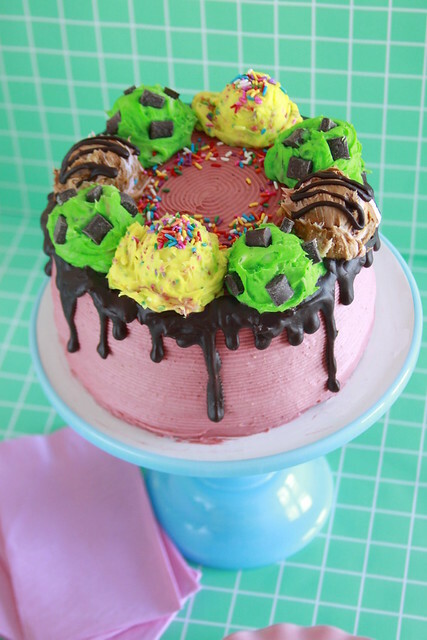 To make the Strawberry Sundae Cake a true ice cream treat, I decorated the cake with dripping streams of chocolate ganache and colorful scoops of fluffy butter cream frosting. The weather can’t stop any desire for dessert! Preheat oven to 350 degrees F. Grease three 8-inch cake pans with baking spray, set aside. Sift cake flour, baking powder, baking soda, and salt, set aside. 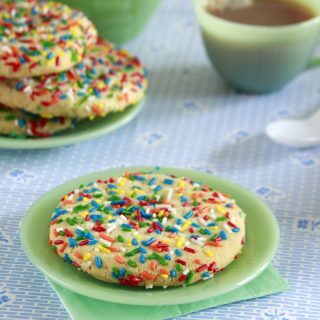 In a stand mixer fitted with a paddle attachment, cream butter and sugar on a medium speed scraping bowl and paddle as needed, until light, fluffy, and pale in color, about 4 minutes. Gradually beat in egg whites followed by sour cream, vanilla, and food coloring. Scrape bowl and paddle. In another bowl whisk together buttermilk and strawberry puree. With mixer on low add dry-ingredients in 3 additions alternately with wet-ingredients in 2 additions, beginning and ending with dry-ingredients. Give batter a few stirs by hand to ensure even incorporation. Divide between prepared pans and bake for 22 to 26 minutes, rotating halfway. 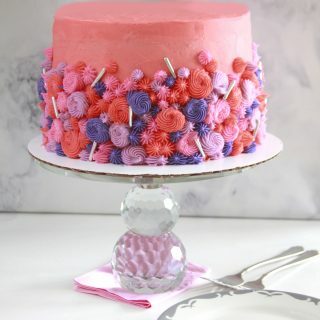 The cakes will begin to pull away from the pans and a toothpick inserted will come out with a few moist, not wet, crumbs. Let cakes cool in pans for 5 minutes. Invert onto a wire rack to cool completely. If making ahead of time, wrap in plastic wrap and refrigerate until you're ready to assemble. Preheat oven to 375 degrees F. Line a baking sheet with aluminum foil set aside. In a large bowl, whisk flour, sugars, cinnamon, and salt. Cut butter into dry-ingredients, once mostly incorporated, add banana puree and vanilla until crumbles begin to form. Spread crumbs in an even flat layer sprinkling with kosher salt, baking for 12 to 15 minutes, stirring a occasionally, until golden and crispy. Cool to room temperature before using. Process freeze dried strawberries in a blender or food processor, using a strainer to filter out most of the seeds, set aside. Beat butter and cream cheese on medium-high speed until smooth and lump free, scraping the bowl and paddle, about 3 to 4 minutes. With mixer on low gradually add powdered sugar, processed freeze dried strawberries, heavy cream, vanilla, and red coloring. Scrape bowl and paddle. Raise speed to medium-high and beat until fluffy, about 2 minutes. Refrigerate until ready to assemble. Apply a bit of frosting onto a cake board and secure the first cake layer. Apply frosting onto cake layer and press in banana crumbs. Stack second cake layer on, repeat by adding frosting and crumbs. Top with the final third layer. Lightly apply a dirty layer of frosting. Refrigerate for 15 minutes, apply a thicker layer of frosting. 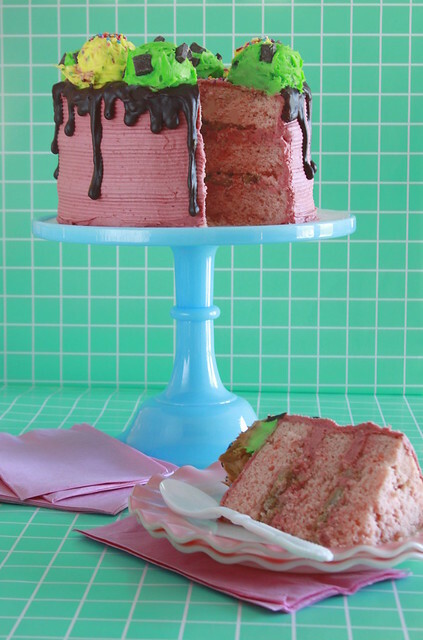 Apply ganache to create a drip border. 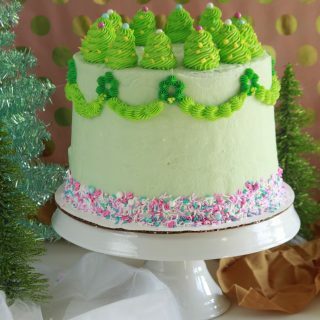 Use an ice cream scoop to apply frosting, creating a border.